You should DEFINITELY leave it as-is. Consistently the best gun to show up in this forum. The look is just perfect. Might be different due to the blowback feature? Pretty sure G&P ones don't fit. I was assuming the blowback was solely contained in the upper receiver. *fruitcage* the haters, I think its badass mate. 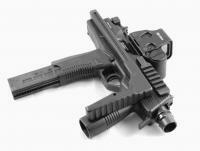 VFC also make one, but it's much dimmer because it only uses a single battery. Unless you're socially awkward, I'd say it's not worth playing. Unless you grew up with it and then phased out when you started noticing girls, you'll never get into it. Gun is the best track on that album. So, is the A&K Mk46 Actually BETTER than the original M249s? or just different parts bolted on? Thought it was the same? The A&K Mk46 still uses the M249 receiver as it still uses the box mag/M16 feed mechanism. It just has extra rail, barrel and sliding stock bolted on. One thing though, I never figured the differences in hop up performance between my A&K Para vs my friends MK1 which had a lot of hop fliers, mine is like a laser beam. All good. Also recommend a FAB Tpod and get rid of the bipod. I had the pot metal bipod mounts replaced with a steel bipod mount and the bipod wasn't hardened to take the stresses. A FAB/ACM Tpod will though. He overbores it so far his thumb is actually underneath the gun. Laccy band - Elastic Band. OH MY GOD ITS RAINING PIZZAS. I also get those. I just get a pair of long tweezers ( The kind you feed reptiles with) and push either side of it to pop them out. Make sure youre looking over a mirror so they fall out of your mouth though. It's kind of gross, like squeezing alien eggs out of your tonsils. You'll need exceptionally good control over your gag reflex to pull this off.